I have a Christmas Book Club party that I was asked to bring a cake for, so I decided to make it a little festive as well as delicious! Here is my interpretation of a Orange-Buttered Spice Rum Cake. 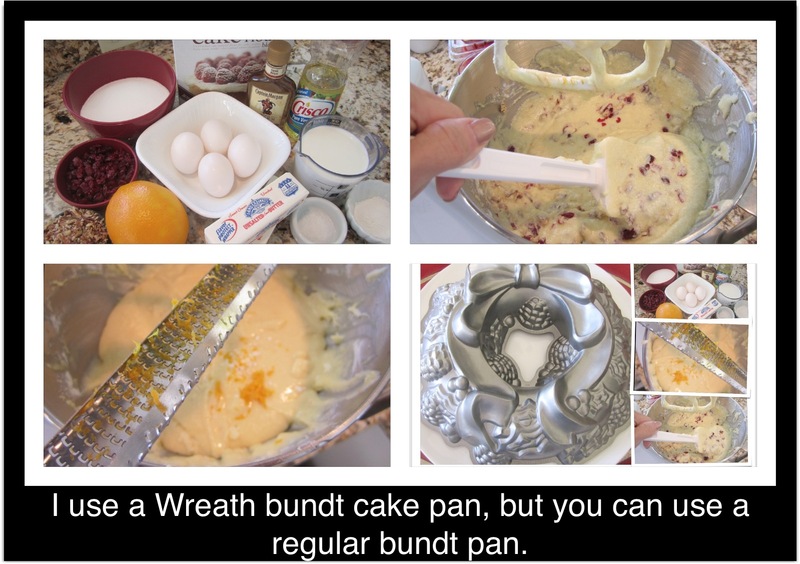 I hope you enjoy it, if you do not have a wreath bundt pan, it works just as well in a regular bundt pan. By the way, Happy Holidays! Have all the ingredients at room temperature. Preheat oven to 350 degrees, position a rack in the lower third of your oven. Grease and flour your bundt pan (I use Pam flour spray). In a separate bowl, sift together the flour, baking powder and salt, set aside. In a small bowl, combine the milk, rum, and veg. oil, set aside. In your mixing bowl, fitted with beater, beat the butter on medium speed until creamy, about 30 seconds. Add the sugar and beat until light and fluffy, about 5 minutes, stopping the mixer occasionally to scrape down the sides of the bowl. Add the eggs and egg yolk one at a time, beating well after each addition. Reduce the speed to low and add the flour mixture in three additions, alternating with the milk mixture and beginning and ending with the flour. Beat each addition until just incorporated, stopping the mixer occasionally to scrape down the sides of the bowl. Fold in the cranberries, pecans and the orange zest, mix by hand until incorporated. Pour the batter into the prepared pan and using a rubber spacula, spread the batter so the sides are slightly higher than the center. Bake until the center of the cake springs back when lightly touched and a toothpick inserted into the center comes out clean, about 45 minutes. Transfer the pan to a wire rack and let the cake cook upright in the ban for about 15 minutes. Tap the pan gently on a work surface to loosen the cake. Set the rack over a sheet of waxed paper, invert the pan onto the rack and lift off the pan. Let the cake cool completely before serving. 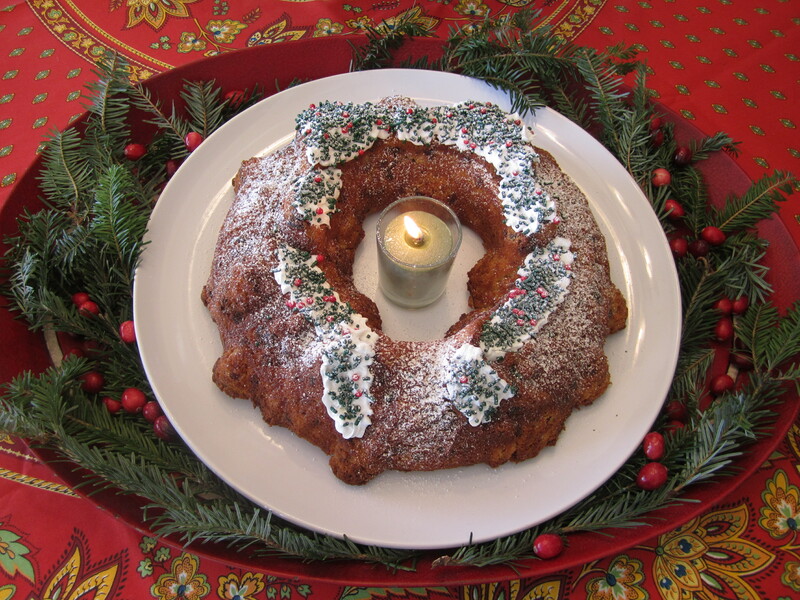 Dust with confectioners’ sugar just before serving. Serves 16. 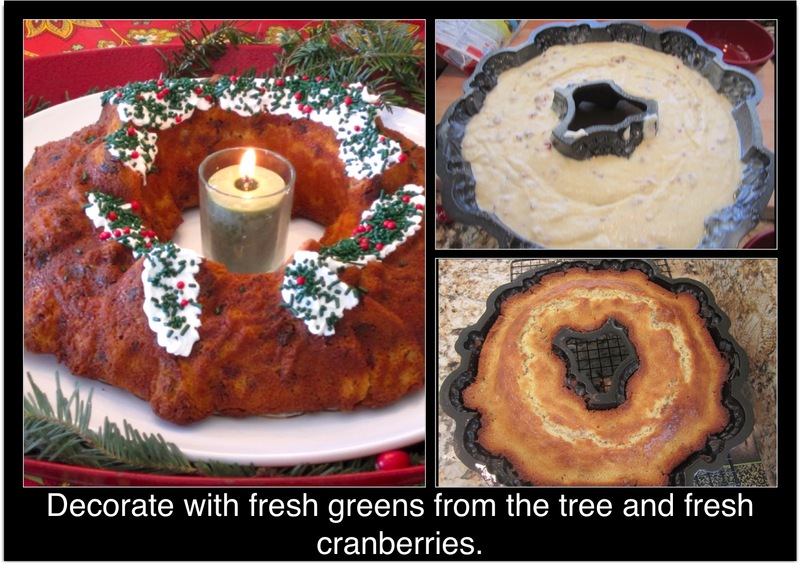 This entry was posted in Desserts and tagged CAKE, Christmas cakes, Desserts, Food, orange buttered spice rum cake, orange cake, rum, RUM CAKE. Bookmark the permalink.